Human consumers of seal products may be exposed to dangerous infectious diseases because Canada processes seals as fish instead of meat. This allows seal processors to avoid using infection control measures that are mandatory for processors of all other commercial meat products, measures that are designed to protect human consumers from contracting mammal diseases from meat, such as tuberculosis, brucellosis, rabies, trichinosis and others. Clip from the cover of a recent Canadian government publication...detailing many contagious ailments of marine mammals that are never found in fish. Several of these can also threaten human health. Yet, Canada processes seals for commercial marketing without screening for these diseases, because the Canadian Food Inspection Agency has determined that "seals are classified as fish." Seals are processed in accordance with fish inspection protocols that were written for cold-blooded aquatic animals. This is simpler and cheaper than implementing meat inspection protocols. Using fish inspection for seals also serves to avoid the problem of seal carcasses being condemned and deemed inedible by veterinary inspectors. Therefore, using fish inspection for seals supports Canada’s ‘fullest possible commercial use of seals’ policy, although the practice is scientifically unsound from a public health perspective. In April 2006, I tried to bring this problem to the attention of Canadian government departments responsible for the seal hunt and for consumer product safety, posting an article on this website and writing letters. I thought that the mandate of the Canadian Food Inspection Agency (CFIA) should lead this department to issue a directive to seal processors ordering them to change from using the fish inspection protocol to using the meat inspection protocol, based on scientific evidence that seals pose meat threats to consumers. After all, the CFIA oversees the application of veterinary knowledge to protecting public health. Here is an update on the issue. Thank you for your correspondence of 25 May, 2006 concerning “Seal product Health Hazard”. Fisheries and Oceans Canada (DFO) is responsible for the management, conservation and protection of Canada’s marine resources, including marine mammals. DFO’s research in marine mammals diseases is conducted in the interest of conservation of the resource, particularly for species at risk or for species of commercial or subsistence interest. The Canadian Food Inspection Agency (CFIA) is Canada’s federal food safety, animal health and plant protection enforcement agency. Health Canada establishes food safety guidelines which CFIA enforces. In your e-mail you forwarded a message which you had originally sent to the Honourable Chuck Strahl, Minister of Agriculture who is responsible for the CFIA. You also copied the Honourable Tony Clement Minister of Health. cc: The Honourable Chuck Strahl, P.C. The Honourable Tony Clement, P.C., M.P. I am writing as the chair of the Nova Scotia-based Grey Seal Conservation Society (GSCS) to ask that the Department of Fisheries and Oceans (DFO) collaborate with us in undertaking a health assessment of seals in the Maritimes Region. Very little has been published in the scientific literature regarding the health status of seals living in this area (grey seals, harbour seals, harp seals and hooded seals). And evidently, marine mammal research at DFO currently does not include any systematic monitoring of seal health. However, the assessment of the health- or disease-status of seals is part of the responsibility of DFO, and this matter carries considerable public significance. Given that seal health was not included in the new National Aquatic Animal Health Program, the Grey Seal Conservation Society is hereby requesting that a DFO-facilitated seal health assessment and monitoring project now be initiated in the Maritimes Region. Please arrange for DFO to meet with GSCS at the earliest possible date to discuss this matter. Thank you. Thank you for your letter of June 2, 2006 in which you enquired about disease monitoring of marine mammals by Fisheries and Oceans Canada (DFO). The department has two marine mammal disease specialists, Dr. Lena Measures at Institute Maurice Lamontagne and Dr. Ole Nielsen in the Central and Arctic Region. In Newfoundland and Labrador Region, Dr. Garry Stenson at DFO’s Northwest Atlantic Fisheries Centre works with provincial veterinarians to deal with specific marine mammals issues. Here in the Maritimes Region, DFO collaborates with the Atlantic Veterinary College, primarily through Dr. P-Yves Daoust. Overall, these researchers maintain close contact with marine mammal biologists working in other DFO regions across the country and with disease specialists elsewhere in Canada and the United States. 3) dedicated research of particular marine mammal diseases. The department is aware of the potential for diseases to negatively affect marine mammal populations, however, it is believed that current research and monitoring by DFO and others is sufficient to identify significant disease outbreaks. Given that disease outbreaks are infrequent in marine mammals and the difficulty of predicting outbreaks, it would not seem prudent to invest more resources at this time. Issues affecting marine mammal meat for either consumption or human health are the mandate and responsibility of the Canadian Food Inspection Agency and Health Canada. On behalf of the Honourable Chuck Strahl, I wish to thank you for your letter regarding zoonotic pathogens in Canadian seal products. The Minister appreciates being made aware of your views and has asked me to convey to you the following information. The Canadian Food Inspection Agency (CFIA) does not endeavour to conceal the existence of reportable diseases in animals. The presence of brucellosis in several wild animal populations of Canada is well documented. The types of brucellosis that occur in Canada’s marine mammal population differ from that found in bison in Wood Buffalo National Park and from the strains of the brucellosis that are found in the wild ungulates of Canada’s Arctic. In general, efforts to increase public awareness concerning any potential zoonotic threat that may be posed by sylvatic brucellosis falls outside the mandate of the CFIA. The Public Health Agency of Canada (PHAC), in collaboration with its provincial and territorial counterparts, has the lead role in this area. You may wish to approach those provincial and territorial agencies with your concerns. It is noted that you copied your correspondence to the Minister of Health, the Honourable Tony Clement, who is responsible for the PHAC. Canada has developed, and is recognized for, one of the safest food systems in the world based on continuous improvement, respect for science based international strategies and audits conducted by foreign governments. Food safety and consumer protection are the CFIA’s top priorities. The CFIA’s role is to enforce the food safety and quality standards established by Health Canada. The CFIA enforces the Fish Inspection Act and Regulations as well as the Food and Drugs Act and Regulations. Seals are classified as fish under the Fish Inspection Act and Regulations, and are therefore subject to the same requirements applicable to fish destined for human consumption, whether domestically on import or, for export. Establishments processing seal products for export (whether interprovincially or internationally) must be registered by the CFIA and must be constructed and operated to meet the sanitary requirements set out in the Fish Inspection Regulations. In order to be registered by the CFIA, the establishments must develop, implement and maintain a Quality Management Program (QMP) plan that describes the controls that will be followed to process the seal products to satisfy the Canadian requirements for safety, wholesomeness and identity. This QMP plan includes HACCP (Hazard Analysis Critical Control Point) controls for food safety based on internationally recognized standards, and includes considerations for contaminants of public health relevance such as PCBs and dioxins. In addition, the CFIA is responsible for enforcement of those sections of the Food and Drugs Act and the Consumer Packaging and Labelling Act as they apply to food (fish). The CFIA is responsible for verifying that the fish processing industry operates within the legislative requirements to ensure that fish and fish products are safe, wholesome and labelled appropriately. Further details regarding the CFIA’s fish inspection activities can be found on the CFIA website at www.inspection.gc.ca/english/anima/fishpoi/fispoie.shtml . I trust you will find this information useful. Again, thank you for writing. Thank you for your correspondence of May 25, 2006, addressed to the Honourable Tony Clement, Minister of Health, concerning the safety of Canadian seal meat. I regret the delay in responding. The consumption of raw meat, butchering practices, and post-mortem examinations have provided cases of human exposure to Brucella spp. from marine mammals. Despite this, there are no reported cases of human infection with marine Brucella spp. In addition, Health Canada recommends that raw meats be handled and cooked properly. The recommendations provided by the Canadian Partnership for Food Safety Education, a coalition of industry, consumer, government, health and environmental organizations, should be followed in order to improve consumer understanding of foodborne illness and measures that can be taken to decrease the risk of illness. Simple measures such as cleaning, cooking, chilling and separating, will minimize the potential for foodborne illnesses from handling raw meat. In conclusion, at the present time, there is minimal risk to the health of marine mammal hunters or consumers of seal products. I hope the foregoing will prove useful to you. Thank you for writing. This is in response to your e-mail of June 16, 2006, addressed to Health Canada’s Atlantic Operational Centre regarding seal oil contamination and the product Terra Nova Omega 3 Seal Oil Capsules. We apologize for the lengthy delay in responding to you. Your e-mail was forwarded to the Natural Health Products Directorate (NHPD) as we are the federal entity responsible for the regulation of natural health products in Canada, including seal oil health products. All natural health products must undergo a pre-market review before they can be sold in Canada. During this review, Health Canada assesses the evidence supporting the safety, efficacy and quality of the product and ensures adherence to appropriate labeling requirements. In addition, the NHPD also ensures that the manufacture of natural health products follows good manufacturing practices. Only natural health products which meet these requirements will be authorized for sale in Canada. Brucellosis contamination is highly unlikely in natural health products that contain seal oil as the process used for the rendering of seal fat to produce the oil would kill any presence of the bacteria. As indicated above, all natural health products are thoroughly reviewed and only those that are found to be safe, effective and of high quality are authorized for sale. Manufacturers must demonstrate that their manufacturing process involves rendering and that there is a quality control system in place to minimize any risk of product contamination in order to receive market authorization from the NHPD. With respect to Terra Nova Omega 3 seal oil capsules, a sample of this product was tested by a Health Canada laboratory and found not to contain Brucella. Thank you for writing. We hope this information is of use to you. Again, we apologize for the delay in our response. It is my understanding that no health inspection is conducted on the seals from which the seal oil is obtained. In Canada, only “official veterinarians” are qualified to attest to the health of animals for human consumption, but this has not been made part of the processing of seal oil. This leaves consumers exposed to potential zoonotic disease risks. That is why I originally asked CFIA to review the HACCP and QMP’s used by the seal processors. In addition, I am also concerned to note that materials used to advertise the seal oil describe a processing method that does not include heat treatment or other commercial sterilization. In addition to zoonotic diseases, I am concerned that this potentially poses a risk of botulism poisoning of consumers. Here is a promotional site from a member of the industry association that posted the above information, claiming “approval for sale in Canada by Health Canada” for their seal oil capsules: http://www.omegavite.com/index2.html - This is misleading, because it refers to an approval given earlier for them to claim seal oil is a FOOD source of omega-3, like the omega-3 eggs, but a form of approval no longer given or required by Health Canada in my understanding. Correct me if I am wrong. Buyers, including Canadians who view this website, might misinterpret the claim to mean that Omegavite seal oil has Health Canada approval as a NHP. CFIA’s response was to tell me that the entire matter of my complaint, including the safety of seal meat and pelts for human consumption had been passed on to Health Canada. Can you let me know who will be the person investigating these aspects of my complaint? 1. Has the product Terra Nova Omega 3 Seal Oil Capsules met your criteria for approval as a Natural Health Product? 2. Does this product have a NHP number? 3. Does the word "rendering," as you used it in your reply, mean that the seal oil must be heat treated? 4. Is the Terra Nova Omega 3 Seal Oil heat treated? 5. Is "healthy at the time of slaughter" (the standard in the Food and Drugs Act relating to animal oils) part of the "quality control system" that the NHPD expects to be in place when products are derived from animals? 6. Do you consider seals to be animals? 7. Do the makers of Terra Nova Omega 3 Seal Oil Capsules conduct health inspections on seals at the time of slaughter that comply with normal meat inspection standards in order to guarantee that consumers will not be exposed to bacterial zoonoses? 8. Is random product testing considered to be an adequate or critical point to control the hazard of brucellosis transmission through food products? The CFIA evidently interprets ‘animal’ here broadly enough to include mammals such as seals, because the words ‘seal’ and ‘mammal’ themselves appear nowhere in either the Fish Inspection Act or Regulations, despite Christine Bakke (CFIA) having written to me that “Seals are classified as fish under the Fish Inspection Act and Regulations…” Seals must be “classified as fish” by inference under this law, because they are not so classified openly. Can ‘animal’ under this law perhaps be taken to mean any organism in the Kingdom Animalia? So, if the CFIA became aware that commercially harvested seals carried brucellosis, or other bacteria of public health significance, then the sale of seal products should reasonably be halted by the CFIA until this particular health hazard has been adequately controlled by the processors, which would necessarily entail a meat inspection protocol…whether or not seals are still viewed as ‘fish’. Interpreting this might be troublesome…because if ‘animals’ legally includes fish, then fish are barred from fish processing establishments. On the other hand, if ‘animals’ in this case refers to non-human mammals, then dogs, cats, rats, bats and seals are prohibited. That interpretation of ‘animals’ would make a certain sense, because bacterial hazards can be introduced by non-human mammals. Another possible interpretation is that ‘animals’ encompasses the entire Kingdom Animalia…and while that would sensibly bar seagulls from entering fish processing establishments, humans would be barred too, which would seem, on the face of it, to be a ludicrous interpretation. That would be about as off-base as interpreting the Fish Inspection Act to mean that seagulls, puffins, loons and seals can be legally processed as fish, or that fish processing can be applied equally to absolutely any other ‘marine animals’…which it could then be argued carries the same meaning as ‘seagoing animals’…which could then be interpreted as meaning even the fishermen themselves. Even the wharf rats, I suppose. At what point did this line of reasoning cross the line to ridiculous and dishonest? It would have been helpful had the writers of the Fish Inspection Act and Regulations included clear definitions ‘marine animals’ and ‘animals.’ My full reading of the Fish Inspection Regulations leads me to conclude that the term ‘marine animals’ was added to the definition of ‘fish’ after ‘shellfish and crustaceans’ to include marine invertebrates that do not have shells, i.e. squid and octopus. ‘Marine animals’ was never meant to permit mammals or birds to be processed under the Fish Inspection Act. This conclusion is supported by the definition of ‘animals' in the related Meat Inspection Act, a law approved the same year (1985) and also enforced by the CFIA. The Section 8 exemption for muskox, caribou and reindeer allows inter-provincial trade of these meats (“if edible”) but they remain barred from import and export marketing (probably because food safety is somewhat lower since no ante-mortem control or veterinary inspection of hunted wild animals is possible). The CFIA provides a mobile meat inspection service for northern Canadians who are involved in hunting and processing these wild meats for commercial marketing. CFIA inspectors rule on which carcasses are “edible” and which ones are “condemned”. Muskox, caribou and reindeer are not treated as 'fish.' Herds of wild caribou and reindeer living in northern Canada are known to be affected by brucellosis and other zoonotic diseases, and presumably the CFIA meat inspectors take appropriate measures to exclude infected animals from those that are sent to market as meat for human consumption. Clearly, the standard should be no less for any commercial trade in seal meat. Any Newfoundlander can tell you that seal is not a fish, that seal is meat. Since 1990, potentially serious zoonotic disease has been found in seals at the same time as the fishing industry has turned towards marketing them for human consumption. To be safe, sane and ethical, Canada’s Parliament should now repeal the marine mammal exemption under section 3 (1) ( c) of the Meat Inspection Regulations. Even before this is done, however, the CFIA has the power to impose appropriate food safety measures on seal processing. Brucellosis, a notifiable disease under Canada’s Health of Animals Act, was diagnosed in harp seals, hooded seals, grey seals and harbour seals in Atlantic Canada in the late 1990’s according to reports published in the Journal of Wildlife Diseases. Brucella is known to be easily transmitted between animals and to be maintained in populations of social animals that tend to congregate in herds, like cattle, goats, sheep, bison, caribou and seals. The scientific literature also subsequently reported cases of the seal strain of Brucella causing serious human illness. Further, it has been demonstrated experimentally that the seal strain of brucellosis is dangerous to cattle. Did these scientific discoveries and publications cause any Canadian veterinarian or Canadian person who analyses animal specimens to form a legally reportable ‘suspicion’ in their mind that Atlantic seals might be ‘affected’ by brucellosis? Did any person subsequently report such a suspicion to a veterinary inspector, and was any seal-occupied area subsequently declared to be an ‘infected place’ or a ‘control area’? Was a five kilometre zone around seals declared to be a brucellosis control area and were people prohibited from removing animals or animal parts from the area? Obviously, none of these infection control measures were taken, and I do not know if any Canadian veterinary inspector ever received a report of a suspicion of brucellosis in the seals. It seems that such a report may have been received without CFIA going on to take steps to control the spread of the disease, as this is within their discretion. 4. Focus on brucellosis in seals: how much do we know, and how has Canada handled this information? Major questions: why has the Canadian government provided public education and food safety programs for hunters and consumers of marine mammals in the Arctic region only, when evidence of seal disease was found in the Arctic and Atlantic Regions simultaneously and the bulk of seals killed for human consumption are hunted and processed in the Atlantic Region? In their letters of response to me, did Health Canada suggest that seal Brucella is not bacteria of public health importance in Atlantic Canada…while CFIA and the Canadian Cooperative Wildlife Health Centre (CCWHC) are suggesting to northern people that seal Brucella is bacteria of public health importance in the Canadian Arctic? “Brucellosis in Ringed Seals and Harp Seals from Canada,” a scientific article published in the Journal of Wildlife Diseases 36(3) 2000, pp 595-598 by Lorry Forbes (CFIA), Ole Nielsen (DFO), Lena Measures (DFO) and Darla Ewalt (US Dept of Agriculture). The title and article abstract in this instance do not identify which species of marine mammals were studied, although the abstract indicates that both cetaceans and pinnipeds (meaning whales and seals) tested positive for Brucella antobodies. ‘North America’ in the title does not reveal how overwhelmingly Canadian the study was. A total of 1855 seals were tested, 1847 from Canada plus 8 stranded harbour seals from the US Atlantic Coast. Of 597 whales tested, 578 were from Canada, while 19 were pilot whales that stranded along the US Atlantic coast. In this study, therefore, 2425 Canadian samples were tested, plus 27 samples from the US Atlantic Coast (i.e. 99% Canadian animals)…no marine mammals were sampled from Alaska, none from the US Pacific Coast and none from Mexico…why then did the authors identify the study area as ‘North America?’ Why, too, did they not write ‘seals and whales’ instead of ‘some marine mammals’ in their title, when no polar bears, otters, mink or manatees were included in their survey? Regarding human health implications, the authors wrote “The zoonotic potential of the newly discovered marine mammal Brucella spp. strains is unknown but given that most of the known strains are human pathogens, it would be prudent to regard the marine mammal strains as such until proven otherwise…exposure to Brucella organisms could occur through dressing carcasses or by consuming raw meat…it is likely that there is risk to people who come in contact with marine mammals that have stranded and are likely to be ill, or those who consume hunted animals. Caution and good hygienic practices are advised in either situation.” Did the authors at this time report to veterinary inspectors at CFIA their suspicion that seals were affected by brucellosis? If these results are considered in terms of Arctic (north of 60 plus Nunavik) versus sub-Arctic locations of the seals that were tested, it can be seen that 11/761 Arctic seals tested positive (1.44%) while 50/1093 sub-Arctic seals tested positive (4.57%). (Note that the table contains an error in the ‘grand total’ of positive findings. 57 is entered, but this is the total only of Canadian positives, while the actual grand total is 61 after the US data is added. Does this error indicate that the American data was added as an afterthought in this study?) The results for whales were summarized similarly, and the findings were similar in that 5.34% of Arctic whales and 7.4% of sub-Arctic whales tested positive for antibodies to Brucella. The percentage of positive findings was higher below the Arctic for both seals and whales. The positive finding was also more consistent and widespread below the Arctic. Of 7 different Arctic locations tested, 3 showed seals testing positive for Brucella exposure, while all seals tested in the other 4 northern locations were negative, suggesting a relatively spotty distribution of the infection in the north. In contrast, positive results were found in seals in every one of the 7 locations tested below the Arctic. Why, then, did these authors and the Canadian government go on to address the potential human health threat of contracting brucellosis from marine mammals by framing it only as an Arctic food safety issue, especially given that greater numbers of marine mammals are killed and consumed in Canada’s Atlantic sub-Arctic region? Canadian Cooperative Wildlife Health Centre (CCWHC) Newsletter 6 - 1. A news item in this (freely available to the public) newsletter was titled “Brucellosis in Marine Mammals of Arctic Canada,” written by Ole Nielsen (DFO), Lorry Forbes (CFIA), and Klaus Nielsen (CFIA). The numbers quoted for the harbour seals are the very same numbers that appear in the table above, seemingly cherry-picked from the larger survey. Harbour seals are small seals that are not hunted, butchered, marketed or consumed commercially. Why did these scientists not report in the CCWHC newsletter that they had also obtained positive brucellosis findings in Atlantic hooded seals, harp seals and grey seals, all species that are hunted commercially for human consumption? Why did they not identify a similar potential disease threat for Atlantic region sealers and consumers of seal products from Atlantic Canada, and why was the CCWHC’s subsequent initiative dealing with zoonotic risks from seals framed only as an Arctic issue? Might political pressure have influenced the handling of scientific information revealing that commercially harvested seals are affected by a reportable disease? Did the DFO and the CFIA go on to initiate any similar work in Atlantic Canada to “determine if marine mammal Brucella are present” or to educate marine mammal hunters and consumers to avoid potential food safety hazards that might arise from the commercial hunt for harp seals, hooded seals and grey seals? If they did, I have not found any record of this work. “Human neurobrucellosis with intracerebral granuloma caused by a marine mammal Brucella spp.” April 2003, reported by medical doctors in the journal Emerging Infectious Diseases, two cases of severe human brucellosis caused by the strain of Brucella that is found in seals. “Marine mammal brucellosis in Canada, 1995-2004” A presentation on this topic was made at a conference held in the Ukraine, by O. Nielsen (DFO), K. Nielsen (CFIA), D. Ewalt (US Dept of Agriculture), S. Raverty (BC Animal Health), R. Stewart (DFO) and B. Dunn (DFO). Does this indicate that as of 2004 DFO and CFIA had initiated no marine mammal sampling program in the part of Canada with the greatest number of hunter-killed marine mammals, the Atlantic region? If not, why not? The Gulf of St. Lawrence isolate refers to the harp seal isolate reported in the DFO/CFIA scientists’ first report, “Brucellosis in Ringed seals and harp seals from Canada.” That seal was not found in an ‘Arctic and Pacific’ sampling program! Were no further Brucella isolation attempts made from seals in Atlantic Canada, despite the relatively high prevalence of positive serologic tests found in the region, the commercial use of these seals for human consumption, and the resulting relatively easy access to large numbers of hunter-killed carcasses? If not, why not? “Marine mammals and "wildlife rehabilitation" programs” DFO Science research document, 2004 by Lena Measures (DFO) This paper recommended that “wildlife rehabilitation” of marine mammals not be permitted by DFO, and that current initiatives be discontinued. This was written in a climate of virtually no (published) knowledge about the disease status of Atlantic seals. A sick harbour seal pup died during a rehabilitation attempt by the sole licensed provider of this service in Nova Scotia. The rehabilitation provider sought a veterinary post-mortem exam of the dead seal, and was told the carcass should not be sent to the Atlantic Veterinary College for diagnosis, but to the Nova Scotia Agricultural College instead. That was done, but follow-up enquiries elicited only the message that the dead seal had been ‘lost.” Ergo, no seal disease diagnosis. Coincidence? BELL: The Department of Fisheries and Oceans has now isolated about nine cases of marine brucellosis in ring seals, harp seals and a beluga whale in the Canadian Arctic. Ole Nielsen says it’s probably affecting narwhal and walrus as well. Nielsen is a marine mammal disease specialist with the department. NIELSEN: The fact we’ve got isolations from the eastern Arctic, from Chesterfield Inlet in Hudson’s Bay and all the way to Holme in the western Arctic, I worry about findings like this. BELL: Nielsen says marine brucellosis causes mainly reproductive problems in the animals it infects, but he doesn’t know if it can cause disease in humans. That’s something he and Health Canada hope to find out soon. Dr. Harvey Artsob is with Health Canada’s national microbiology laboratory. ARTSOB: We are certainly at the stage of saying we think this is a legitimate problem and we are now in the planning stage to see whether we can in fact undertake the study by getting some blood samples from individuals who handle marine mammals up north. BELL: Artsob says determining if marine brucellosis is a risk to people in the Arctic has become one of Health Canada’s priorities. BELL: Patricia Bell, CBC News, Iqalawit. “Seroprevalence of Zoonoses in Nunavik: Surveillance and risk factor assessment” In 2004, led by public health professionals in Quebec, blood was collected from over 900 Inuit to test for exposure to a range of zoonoses, including those known to be carried by marine mammals. Report not located yet. The biggest risk from toxoplasmosis is to people with weakened immune systems and to unborn babies, as severe birth defects can result if the mother becomes infected with this parasite during pregnancy. This is included here to remind readers that this story, and the argument that seals cannot be safely processed as fish, is not all or only about brucellosis. There is no legal reporting requirement for toxoplasmosis under the Health of Animals Act, yet it seems the CFIA might reasonably be expected to act on this information when they provide food safety guidelines to the processors of Nova Scotia grey seals…even if the CFIA still thinks seals are ‘fish,’ the presence of toxoplasmosis would render seals ‘unwholesome’ under the Fish Inspection Act. “A comparison of four serologic assays in screening for Brucella exposure in Hawaiian monk seals,” in the Journal of Wildlife Diseases 2005, 41(1) pp 126-133 by O. Nielsen (DFO), K. Nielsen (CFIA), R. Braun (Hawaii) and L. Kelly (CFIA). “A survey for Brucella spp. antibodies was undertaken on 164 serum samples from 144 Hawaiian monk seals (Monachus schauinslandi) from the northwestern Hawaiian Islands collected between 1995 and 2002…” In which Canadian scientists report doing surveillance testing for brucellosis on American seals. Have these researchers also been employed doing similar testing on seals from Atlantic Canada? If so, where are those results reported? 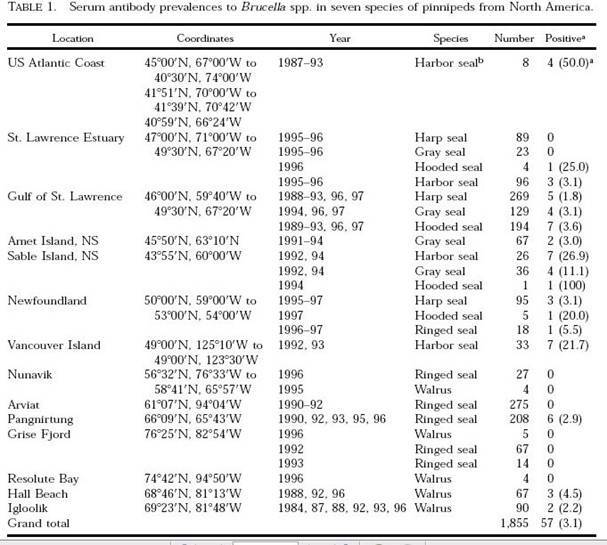 “Hematology and serum chemistry of harp (Phoca groenlandica) and hooded seals (Cystopora cristata) during the breeding season, in the Gulf of St. Lawrence, Canada,” in the Journal of Wildlife Diseases 42(1), 2006, pp. 115-132, by France Boily (DFO, a veterinarian), Sandra Beaudoin (veterinary faculty at University of Montreal) and Lena Measures (DFO). Harp seal mother-pup pairs were killed and adult hooded seals were live-captured to obtain blood samples that were analyzed by these scientists for blood cell count and blood chemistry values. What they reported in this paper was the normal values of these blood parameters for these seals, and they reported no testing and no evidence of any “wildlife diseases” at all. However, did these scientists also test the seals’ blood for brucellosis and other zoonoses, and did they collect seal tissues besides blood for disease testing? From the harp seals that were killed, did the researchers also take spleens, livers, lymph nodes, etc. so that they could conduct a full disease screen profile on the animals? All things considered, it is hard to imagine that this was not done. If these researchers found evidence of brucellosis in seals, did they report this finding to a veterinary inspector at the CFIA as they were obliged to do under Canada’s Health of Animals Act? Or did they send seal tissues to someone else, inside or outside Canada, to be checked for brucellosis? Darla Ewalt needs a permit to import marine mammal tissues from Canada into the US because of the import ban imposed by the American Marine Mammal Protection Act of 1972. Since she had already been involved in testing harp seals for brucellosis, it seems curious that Ms. Ewalt did not include this species in her permit application. If Ms. Ewalt did happen to diagnose brucellosis in seals harvested commercially in Canada, she would presumably not be bound to file a report under Canada’s Health of Animals Act. However, if she sent her report to Canadian scientists, would they then be obliged to report her finding to the CFIA? Why do we have DFO/CFIA scientists testing for brucellosis in American seals while Canadian seal samples are being sent to the US to be tested for the same disease? “International Polar Year Proposal for 2007-2008: Brucella-infections in seals: Zoonotic potential of marine Brucella sp. and the combined effect of infection and exposure to persistent organic pollutants.” This project is proposed and will be led by the Norwegian School of Veterinary Science. However, DFO employees Ole Nielsen and Garry Stenson are listed as collaborators, and the list of planned study locations includes Newfoundland. Therefore, it seems commercially harvested seal herds in Atlantic Canada might soon be tested for brucellosis in another foreign-initiated study? Formal veterinary advice from the IVWG was presented on day 1 of DFO’s November 2005 seal forum, and the recommendations were largely limited to ‘humane slaughter’ considerations. However, at the end of the second day, IVWG member and American veterinarian, Lawrence Dunn, returned to the podium and gave a brief presentation to the forum on seal brucellosis, explaining that he had diagnosed this bacterial disease in some stranded seals in New England. My recollection of his talk does not include Dr. Dunn saying that he had diagnosed brucellosis specifically in ‘harp seals’ in New England, seals that had strayed south from the Canadian herd, and I therefore assumed he was telling us he’d found brucellosis in harbour seals and grey seals. Dr. Dunn then asked the sealers at the forum to let him test their blood for Brucella antibodies. This item was not included on the formal agenda, and it took place on the second day of the forum, after the Canadian veterinarians who had participated in the IVWG had apparently left the meeting. In the Canadian Arctic, marine mammals and humans both have been openly studied to determine the extent and seriousness of marine brucellosis and other zoonoses. First, get a handle on what fraction of wild animal herds are carrying a pathogen, and then find out how many people have contracted the infection and whether or not it has made them ill. This is absolutely above-board, and as far as brucellosis in food animals is concerned, this approach is pretty much in line with what the FAO/WHO recommends to developing countries. But that is not what is happening in Atlantic Canada, where the approach seems best described as strategic non-surveillance of wildlife diseases in commercially used seals. Does the Canadian government have an aversion to acquiring this type of information, perhaps an especially strong aversion to veterinary diagnosis of infectious diseases in Atlantic seals? Is that why it seems only a few clues will be quietly uncovered by foreign investigators rather than having this matter examined by open scientific enquiry inside Canada? Mr. Elkin seems to have been worried, in part, that big game hunters (for caribou?) might not continue to bring their business to the NWT if too much information was made public about diseases in the animals. He may have a point, especially if the native hunters do in fact know how to avoid the risky animals and if “condemnation of the carcass” ultimately stands to prevent human consumption of any diseased hunter-killed animals. It may be unfair of me even to include Mr. Elkin’s comments here, because nothing has led me to think that hunters in the Northwest Territories ever avoid condemnation of diseased wild mammal carcasses by any strategy, let alone by pretending they are fish instead of meat, the routine used by seal processors in Atlantic Canada. Public education on seal diseases in Atlantic Canada, and on the absence of any screening process to ensure that diseased seal carcasses are condemned as inedible, this could definitely “influence harvesting or consumption patterns”…this could potentially end the commercial seal hunt. This story is presented here only to give an idea of what might happen if Canadians contract brucellosis and their doctors do not think to test for the disease, because the diagnosis of brucellosis can be confused with cancer of the lymph nodes. I do not claim that the bacteria that caused this girl’s illness was Brucella, because I do not know what it was, nor do I know any more about this case than what was reported in the newspaper. The type of bacteria was not identified in the story, but it seems the girl’s symptoms resolved spontaneously after several months of severe illness. Brucellosis has long been known as “undulant fever” in parts of the world where it is commonly found, because the symptoms in humans can wax and wane for months at a time. Some people fight off a brucellosis infection after an initial illness, while others, if untreated, go on to live with recurrent chronic symptoms for many years. If medical doctors do not look for brucellosis, they will not find it, and most Canadian physicians have never seen this disease because our meat supply has been ‘brucellosis-free’ for years. Physicians working in the Canadian Arctic have seen human brucellosis, however, because several cases yearly are diagnosed in people in the north (presumably contracted from caribou and reindeer). Someone else has previously requested information on brucellosis in Canadian harp seals through the federal Access to Information Act, but I cannot determine who made this request or what information they might have received. Canada has recently implemented two new wildlife disease monitoring programs, the “National Aquatic Animal Health Program” (NAAHP) and “Canada's National Wildlife Disease Strategy”. However, I have found no indication to date that either of these initiatives has led to any open surveillance of the infectious disease status of seals in Atlantic Canada. A DFO paper titled “Aquatic Monitoring in Canada: a report from the DFO Science Monitoring Implementation Team” explains with regards to the NAAHP: “This program is tightly focused on a specific set of listed, infectious diseases of aquatic animals that impact international trade in seafood products or are expected to cause harm if inadvertently introduced or moved within Canada.” While it seems at first glance that the new NAAHP (with $59 million in new federal funding to be used by DFO and CFIA) should lead to monitoring of seal diseases because they could “impact international trade in seafood,” the literature on the NAAHP indicates that the program is focused only on diseases of fish raised in aquaculture. From what legislation does the NAAHP draw its authority? The NAAHP is formed under the legislative authority of the Health of Animals Act and Regulations. What role do the provinces and industry play in the NAAHP? The CFIA and DFO regularly consult industry sectors and provinces with interests in wild fisheries and/or aquaculture. Members from industry as well as the provinces have seats on the Aquatic Animal Health Committee, which advises the CFIA and DFO on matters relating to the development and implementation of the NAAHP. Information is shared extensively with all stakeholders as major components of the NAAHP evolve. This approach ensures a comprehensive and coordinated aquatic animal health management program for Canada. Were Canadians at risk before the NAAHP? Are there aquatic diseases that pose a human health or food safety risk? No, the NAAHP was introduced to protect Canada’s aquatic resources from diseases of concern. None of these diseases is known to pose a threat to human health. It is important to note that the NAAHP is not a food safety program. Reportable diseases are diseases that have been prescribed reportable by the Minister of Agriculture and Agri-Food pursuant to the Health of Animals Act. These diseases are listed in the Reportable Diseases Regulations pursuant to the Act and are of significant importance to human or animal health or the Canadian economy. Animal owners, veterinarians and laboratories are obliged to immediately inform the CFIA if an animal is suspected of having contracted any of the listed diseases. The answer to Q9 above seems to reveal that the CFIA limits the meaning of ‘aquatic diseases’ to diseases affecting cold blooded ‘aquatic resources’. The answer “No…none of these diseases is known to pose a threat to human health” in response to the question “Are there aquatic diseases that pose a human health of food safety risk?” seems to reveal the same assumption that realistically lay beneath the creation of the Fish Inspection Regulations, the belief that people cannot catch fish diseases and that the involvement of veterinarians and meat safety protocols is therefore not necessary in fish processing. Why, then, does the CFIA insist that “seals are classified as fish” for the purpose of food processing, when even their own scientists have warned that seal diseases can potentially threaten human health. In Canada, therefore, seals are omitted from the NAAHP because they are not fish but mammals, while seals are simultaneously exempted from the Meat Inspection Regulations because they are marine mammals, and a creative misinterpretation of the Fish Inspection Act is then used to argue that these marine mammals can legally be processed as fish. So seal diseases disappear in a fog of confusion? How long can this farce go on? Will one of the Atlantic Provinces and naïve members of the fishing industry soon innocently ask DFO and CFIA to include seal disease monitoring in the NAAHP? That situation has been resolved, but it took certainly eight years of my time, and time before that, and the time of Mr. Efford, when he was the minister here, to get that resolved. "Mr. Peter Stoffer:… “You probably read in the Chronicle Herald newspaper last week an article by a woman named Debbie Mackenzie, who is from Mr. Keddy's riding, I believe. She was talking about diseases that seals carry, like brucellosis, tuberculosis, and so on. She made the allegation that CFIA or DFO is not doing a complete health analysis of the seal meat when it is being exported overseas. I am just wondering if you could comment on that particular article, because I have not heard a countervailing argument to what she has stated about the handling of the meat, and the concern that fishermen should have for handling seal meat, and also about the various diseases that seals do carry, if indeed they carry them at all. Mr. Denny Morrow: Thank you, Mr. Stoffer. … With regard to the article in the Chronicle Herald, brucellosis was mentioned. Again, with my farming background—and Mr. Keddy, perhaps you can help with this—I know that brucellosis is a disease that cattle and bison get. It affects their reproductive system and causes abortions. I understand from raising cattle that the main way that human beings can get the disease or suffer some effect from it is to drink the milk of infected cows. Eating the meat doesn't transmit it. I understand it is spread by the bulls. So I am not sure what her reference is to here, how it is going to spread, whether there is going to be interbreeding of seals and cattle, or what. I'd hate to think of that. In any event, I am unaware of any evidence showing that the disease is present in grey seals. If it were, their pupping wouldn't be very productive. We know it is on Sable Island. There hasn't been a fall-off in the pupping out there. So I don't think they are experiencing a lot of abortions. If there is some impact of this, somebody had better tell the Inuit of Canada and Greenland, because they eat a lot of seal meat, and we don't hear any reports of any bad things happening. But there is a danger in allowing the herd to expand to the point where you do have distemper or other diseases that have developed around the world in any wild animal population or seal population. The article in the Chronicle Herald referred to by Mr. Morrow was “Stricter Food Safety Rules Needed for Seals.” The Chronicle Herald included in the story a link to my in-depth explanation of the scientific evidence that supports my raising this concern, http://www.fisherycrisis.com/seals/seal%20products.htm . On April 18, 2006 Mr. Morrow made a similar presentation to the Nova Scotia legislature standing committee on resources (http://www.gov.ns.ca/legislature/hansard/comm/r/re_2006apr18.htm excerpt p 29). “MR. CHAIRMAN: I'm curious about how seals are manufactured when you get them on the boat. Well, I'm not sure if CFIA would regard seals as fish, but a marine product, I'm just curious, anything else that's done - I mean, we can't kill a beef and send it to New Brunswick unless it's in a federally inspected facility. Do they set up any standard? You were saying you can't have sand, grass, whatever, on these carcasses, which would make some sense, so how do they line up, doing this on a boat - I suppose you can set a boat up as a provincially or federally inspected facility, but what kind of standard are you required to meet on that? MR. MORROW: CFIA sees this as a fisheries product, so it's treated by the fish inspection side of their operation. What we have to do is work out a HACCP program, and I think you're aware of HACCP - Hazard Analysis of Critical Control Points - so product coming into a plant for processing can't be tainted, decomposed, or unwholesome. That's the standard, it has to be inspected coming in. So any plant that's going to process it is going to have a quality management program, a HACCP program with CFIA, and is going to have to work out a protocol with the harvesters as to how they handle that meat on board. We're talking about not contaminating it with things and also temperature control. Yes, we are working on that. We do have co-operation from the Canadian Food Inspection Agency, and of course our customers in Asia are very concerned about getting a quality product. They were very pleased with the samples we sent over. It is a difficult thing to do, but it can be done. One of the problems in the Newfoundland and Labrador industry is this race for juveniles, to utilize the meat. The meat is not really taken care of, the harvesters in Newfoundland and Labrador, if they're getting $80 or $90 for a pelt, that's what they're interested in. The meat is something that if they can get anything for it - so they don't take a lot of care with it, I'm told. There has been some experimentation with markets, and it's bad for us actually, what they've done. We want to divorce ourselves from the Newfoundland and Labrador industry, with regard to meat, and develop grey seal as a new product, as something completely different coming from Nova Scotia and handled in a HACCP-controlled environment. MR. CHAIRMAN: Mr. Fage can probably correct me, but I think in Nova Scotia we're brucellosis-free in our cattle herd; there's some evidence of brucellosis in seals. How do you ensure the safety of the product if it turns out to be 3 or 4 per cent of . . .
MR. FAGE: It wouldn't be a concern, because brucellosis is a disease of animals, not humans. Nobody else has a seal population that would be tame or cultivated. I don't think they would look at it . . .
MR. CHAIRMAN: But you're not connecting it to human health? The fishing industry does not seem to understand why the CFIA and DFO continue to refer to seals as ‘fish’ instead of ‘meat.’ The main reason seems to be that if seals were processed and inspected as ‘meat’ instead of ‘fish,’ a great many more hoops would need to be jumped through by seal processors, market possibilities would shrink, and seal meat might be condemned and deemed inedible by veterinarians. If seal meat was treated like wild caribou or reindeer, before the meat could be marketed commercially inside Canada, veterinary inspection would need to be carried out on each carcass, and then, even seals that passed that test would be barred from the export market. Denny Morrow, representing Nova Scotia seal product exporters, received information that questioned the safety of the seal products. That much is verified in the government committee transcripts above. Did Mr. Morrow subsequently investigate this information? And did he conclude that the seal products constitute a public hazard and go on to notify the CFIA? Actually, I have reason to believe that Mr. Morrow may indeed have taken these steps, but I am unaware of what actions were subsequently taken by the CFIA. threats, and it must therefore be corrected. Please acknowledge receipt of this message and forward it to your members. Might the concern about damaging the reputation of Canada’s fish processing industry at least carry some weight with the CFIA’s political bosses, even if questions of 'consumer protection' and ‘serious contamination’ of products do not? DFO continues to lead the fishing industry down the road to ruin, by using a politically misguided, head-in-the-sand resource management philosophy. Canada’s current approach to commercial seal hunt management represents a new low on two important fronts. DFO’s recent “fullest possible commercial use of seals” policy seems to demand that Canada compromise the integrity of the CFIA and the veterinary profession, and that valid public health concerns be ignored. Amazing, really, but it gets worse, because DFO’s aversion to inconvenient scientific discoveries has extended to suppressing matters much more important in the big picture than a few seal diseases. Elsewhere, the health of seals and other top marine predators is considered to be an important indicator of ocean ecosystem health, and the health of these animals is monitored for that reason whenever an opportunity arises (often through stranding events, because hunting marine mammals is rare in developed countries, but non-lethal sampling is also sometimes used.) In the international scientific arena, serious concern is mounting about the failing health of the larger ocean ecosystem and all of its top predators, including marine mammals. However, it seems DFO ‘fisheries’ management can and does simply refuse to hear anything about these matters: the health of seals, or the health of the ocean ecosystem. These two factors are intimately connected, linked together in ways that were long unsuspected. Marine ecological studies conducted by DFO scientists in recent years have made the unexpected finding that seals, as top predators, play an important role in maintaining the health and integrity of the entire ocean food web. Further, it has been concluded that major damage to the functioning of the entire ocean food web in Atlantic Canada has already been triggered by large predator reduction through fishing. One result is that seals now patrol the waters as the lone type of important large predatory sea animals, where once they were assisted in their food web maintenance/recycling role by countless large fish that shared the same ecological niche, by eating and processing the same food, small fish. One management implication of the new ecological insight is that seal numbers in Atlantic Canada should not be reduced at all, despite their recent increase in numbers, because this carries an unacceptable risk of deepening the ecological damage, including the starvation of groundfish, damage that has already been caused by large scale predator removal. Naturally, the fishing industry does not suspect this, nor are they likely to accept this argument coming from a source such as this website. The industry, and indeed the general public, needs to engage in a serious discussion with the ocean ecologists, but it seems that under DFO’s current regime this is cannot be done because our publicly employed marine ecologists are gagged, and forbidden to comment on fisheries management issues. A corrupt political power play with smoke everywhere and seals being killed in the crossfire? The truth is it's worse than that, because animal life overall is dying back in the sea. The tragedy is that Canadians are losing the chance to apply the knowledge we have today in making realistic plans for tomorrow.